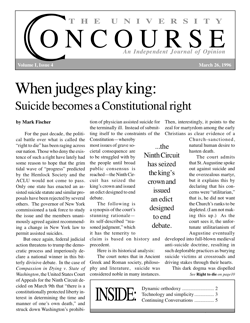 In my article appearing in the February 27 issue of the Concourse I sought to make two points: that there is a Christian Philosophy and that the Church prefers St. Thomas. Then I invited Franciscan University to prefer what the Church prefers. I had hoped my closing statement about a “preference which is not exclusivism” and my references to popes saying basically the same, should have laid any fears to rest. So, while substantially agreeing with Mr. Gordon as regards the freedom of philosophical schools in the Church, I should like to make some observations on the issues he raised in his response (March 12 issue) to my article. To begin, I do not think it is inappropriate to refer to Church statements about philosophy. Mr. Gordon sought to prove what he called the unhelpfulness of my survey by conducting one of his own—not in an area of great unanimity as I did, but in the very difficult area of religious freedom. This is perplexing, because from the fact that some surveys pose difficulties it does not follow that surveys as such are unhelpful, and because a superficial treatment of a sensitive area (which careful consideration would show to be less problematic than appears at first sight) does nothing but relativize the Magisterium. To my mind, if the Church deemed it “inappropriate” or “unhelpful” for one to consider her constant mind on a matter, She would simply remain silent on that matter. At any rate, my premise in surveying the Church’s constant mind on St. Thomas was that her trustworthiness extends to philosophical matters. Regarding Newman, I think it is a bit much to say that he “felt no real need to study Thomas.” The brilliant Cardinal seems to have known Thomas well enough to assert that “all good Catholics must feel it a first necessity that (their) intellectual exercises ... should be grafted on the Catholic Tradition of philosophy, and should not start from a novel and simply original tradition, but should be substantially one with the teachings of St. Athanasius, St. Augustine, St. Anselm and St. Thomas…”1 Elsewhere he went so far as to write (a compliment both to Thomas and himself): “I have no suspicion and do not anticipate, that I shall be found in substance to disagree with St. Thomas.”2 Many passages could be cited where he refers to Thomas in terms of highest praise or where he uses Thomas to expound a point, but space constraints make this impossible. A similar study could be done in the case of Blessed Edith Stein. As regards the Franciscan rule: I think it would be going too far to say that if a Franciscan saw in St. Thomas what the Church sees in him, he could not prefer him as She does. Nevertheless, in our concrete situation we are not talking about displacing Franciscan Philosophy from the primacy it has at FUS, unless you want to call Husserl, Scheler and Von Hildebrand Franciscan philosophers. At FUS it is not that we have a Franciscan philosophy and thus cannot give primacy to St. Thomas. We have a philosophy, rather, that sees it as axiomatic that it ought not give preference to any tradition. Mr. Gordon raised several other points. I am unable to deal with them adequately due to space constraints. But a concern Phenomenologists raise remains. They hold that it is dangerous to treat anyone as a master (meaning, I presume, treating anyone’s work as a closed system), for this would pose the danger of giving a system primacy over reality. But in seeking to avoid this danger, the Phenomenological approach has fallen into the opposite danger of historical isolation (apparent in the short and exclusive bibliographies characteristic of Phenomenological works) for which it has rightly been criticized. Is it possible to strike a balance? I think John Paul II has struck it, adopting Thomas’ own open, realistic historical approach. As John Paul II sees it, giving preference to St. Thomas (which entails a thorough knowledge of that master) in no way undermines but actually strengthens his power to be open to reality, revealed and natural. Thomas does not sacrifice experience for the historical nor the historical for experience, because reality is too great to be captured by either. The growing knowledge of reality is a common enterprise of mankind, not an isolated experience. And if one should say that a freedom unhindered by any tradition is necessary for one to make a contribution, I would simply observe that one need not be hindered but can actually see further standing on the shoulders of giants (consider what would be the development of any discipline that systematically refused to do this). One should not value the unhindered preservation of his own rivulet above being part of that great river of the common intellectual enterprise of humanity. John Paul II does not fear to ride this great torrent where philosophically St. Thomas has the primacy. He shows this continually, bringing this patrimony to bear on the crucial issues of our time (as he masterfully applies it, for example, to morality in Veritatis Splendor). The key is in seeing St. Thomas not as embodying a closed system, but a “realistic and historic method, fundamentally ‘optimistic and open.”3 In promoting “the master of philosophical and theological universalism”4 the Church is evidently not promoting a closed system. The balance of the experiential and historical which he embodies, while more challenging than an a mostly experiential approach, is in the end better for both philosophy and theology. Building solidly on this patrimony actually preserves us from a much greater danger that could be termed the “occupational hazard” of philosophers: to absolutize one’s experience at the cost not just of historical isolation, but of isolation from the Catholic Faith. Such was the unfortunate case of Max Scheler, the Phenomenologist most admired by the Pope, who converted to Catholicism but later abandoned the Faith, adopting a kind of pantheism. The notion that we need not fear falling—and falling quite low—is overly optimistic. On the other hand, when the Church declares someone the “Common doctor” it is sign that he is not to be feared. Rather, I would say, those who would spread fear about him should be feared. And if one still feels the temptation to relativize: let us recall that from among all the approaches the Church could have made primary (not exclusive) in her dialogue with the world, She has freely chosen—and chooses—Thomas’ because, presumably, it is the best. I think on this basis and not on that of any partisan spirit the Church prefers St. Thomas. And so I renew my invitation to Franciscan University to make her own the preference the Church has made her own.